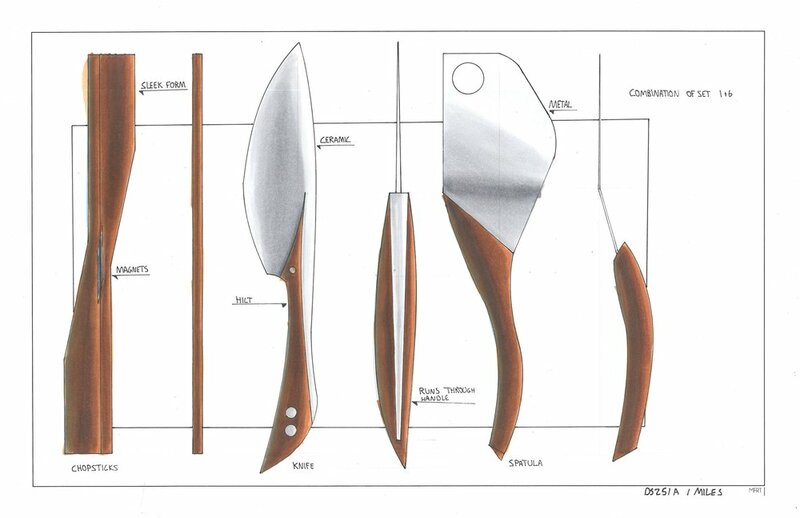 Kitchen utensils made with a walnut body, accented with a cork grip, and a ceramic blade / highlight. 36 Drawings 12 Models made 248 Cups of coffee. 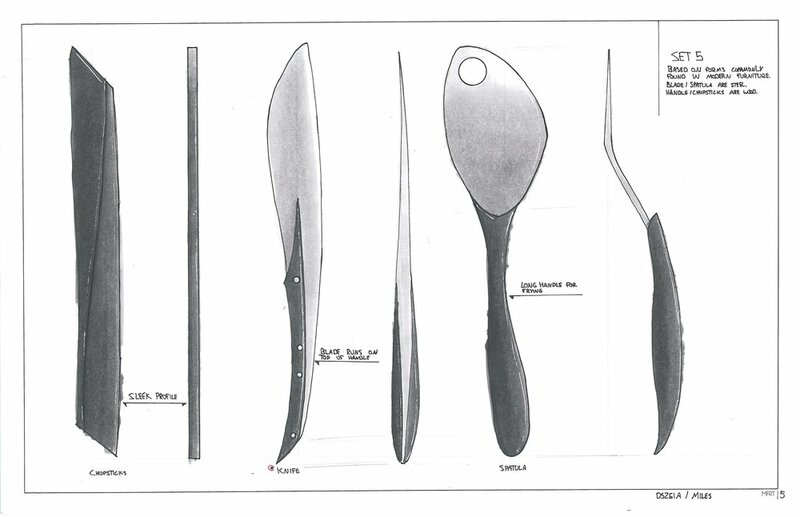 Most American college students are getting by with the bare minimum in terms of kitchen utensils. College students typically purchase the cheapest items, often overlooking things such as the type of plastic, design and re-usability. 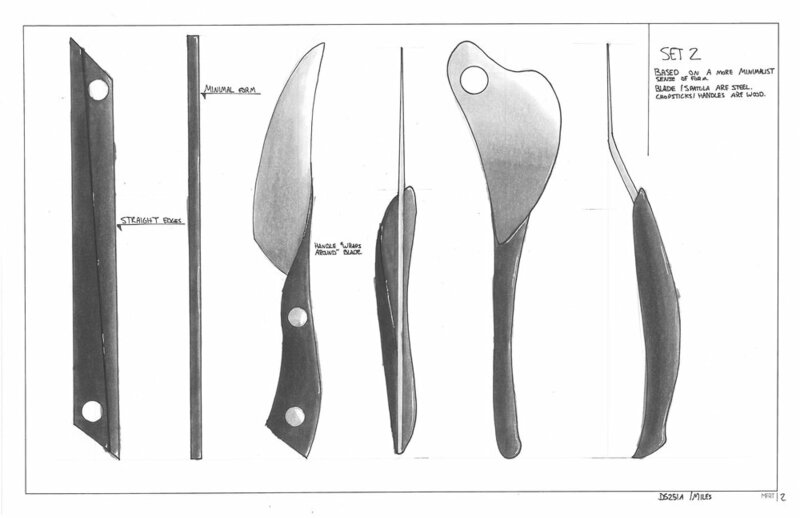 The objective was to conceive and develop 3 kitchen utensils that would be inexpensive, functional, well designed and environmentally sensitive all whilst appealing to the American college audience. A set of chopsticks, an 8" cooking knife and spatula were decided upon by the client. Analyse a wide range of utensils available globally in order to understand the different product sets available, and then specifically focus on utensils available at stores where college students shop. I made note of the good, the bad and the plentiful ugly. 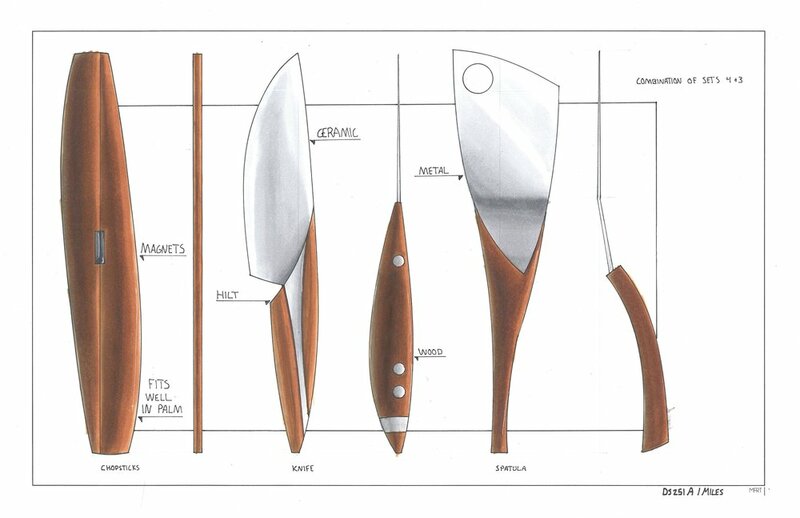 Consider kitchen utensil requirements and develop different concepts for knives, spatulas and chopsticks. Chose 2 sets from the concept list, prototype them and then put them to the test in the kitchen. Of the 2 sets, select the one that worked best, and then return to the drawing board to develop a refined concept ready for final model making. Purchase quality materials and work diligently against a deadline to smooth-out every detail of the end product. Present the final model, concept and process to the client. Fun fact, I cut the onion with the "wooden" knife. Quotation marks because it is supposed to be a ceramic blade, but was spray painted to look like ceramic instead. I was surprised at how well it cut.